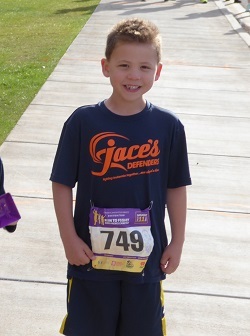 Six year old Jace Hyduchak was the Honorary Race Starter for the Run to Fight Children's Cancer on Saturday, March 11, 2017. Diagnosed just after Thanksgiving at the age of 5 years, Jace continues his three-year treatment plan for Acute Lymphoblastic Leukemia. Jace turns 7y in October and his passions are superheroes and baseball! Read all about Jace here.